Until Bastille Day this year my memories of the Côte d’Azur – the French Riviera – were unsullied: an azure coast, sun, Nice airport with its apt kerbside parking sign Kiss and Fly,and a string of glamorous sounding resorts where numerous authors including Robert Louis Stevenson, Somerset Maugham, F. Scott Fitzgerald, D.H. Lawrence, Aldous Huxley, Graham Greene and Katherine Mansfield wrote while living, visiting or seeking health cures in the Mediterranean climate. R.L. Stevenson wrote A Child’s Garden of Verses in Hyères, an old town close to the Côte d’Azur. Aged about 9, I would take the book to bed with me, fascinated by Bed in Summer in which Stevenson wrote of the northern hemisphere’s long hours of daylight. I could never reconcile the fact this gentle poem was by the same man who’d written Treasure Island. My school had shown an old black and white film adaptation of the pirate novel, and it had scared me to the point I never wanted to read the book. 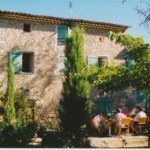 A number of years ago we joined the UK branch of our family on a holiday in a large, rented stone house in southern France. It was a time the Sydney Olympic Games were underway and the twin towers in New York still stood. From the Gard du Nord station in Paris we glided south at great speed on a TGV, crossing the mighty River Rhône before reaching Marseilles, and then seemingly crawling via Cannes to Nice. That night both families met at a square in the old part of the city to eat under the stars. Next morning we drove a few kilometres inland to the farmhouse set in a gnarled olive grove, uphill from a farmer who supplied us with rough red from his vines, and a few minutes from a town where bakeries sold baguettes until midday and the local mayor of the time decreed all public lavatories be permanently locked to deter drug users. It was a week crammed with catching up, deciding which of the wide range of olives at the market we should buy, playing card games and fiddlesticks with the children, explaining horse butchers to them, being surprised by French wasps’ preference for paté over sweet foods when we ate on the terrace, and wishing we didn’t have to part ways. 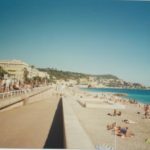 All too soon it was back to Nice and along the Promenade des Anglais to the airport. We carried a host of memories in which the sun always shone, until recently when the Promenade reached the pages of the press for the most terrible of reasons: deliberate carnage. 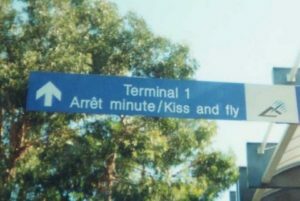 The light-hearted directive Kiss and Fly has been knocked by the shock of kill and flee, but the French attitude is not defeated. A beautiful post Diana, painted with happiness and sadness. Thank you, Corinne. Yes, the recent event brought our time there back into sharp relief.